Alchemy is a small pub in Old Colorado City that I’ve been meaning to try for months but haven’t really made an effort. Thursday night there was a Colorado Springs Young Professionals event there, so I grabbed my friend Elizabeth and we decided to try it out. The restaurant is small but very cozy. It’s dimly lit and has a surprisingly intimate atmosphere for a pub. Elizabeth has already been to Alchemy once before for drinks, so she ordered something called the Candy-Land Martini and I ordered the Elderberry while we browsed the food menu. 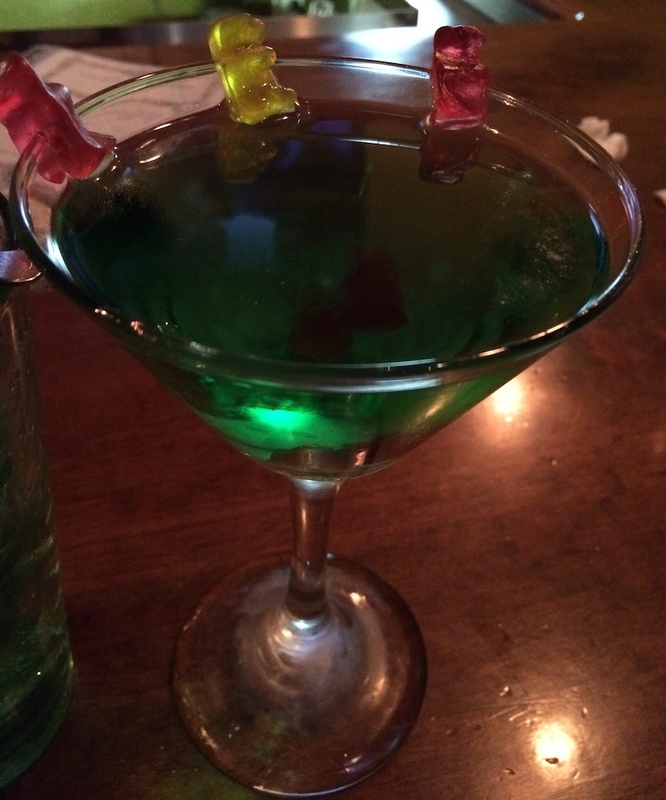 The gummy bears on the rim were a cute garnish. The Candy-Land was too sweet and strong for me but Elizabeth loved it. 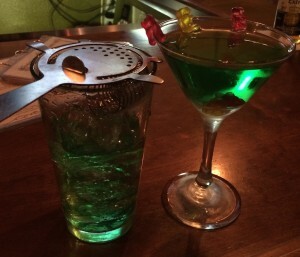 It has raspberry vodka, Midori, Blue Curacao, Sprite, sour mix and gummy bears. This one has only a couple gummy bears because she asked for less, but last time she got one the glass was half filled with the candies. 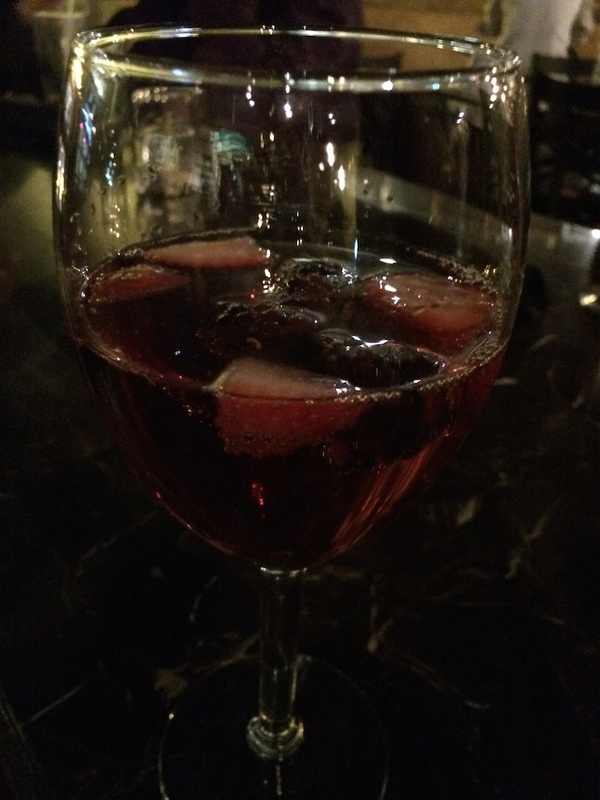 The Elderberry was a glass of champagne mixed with St. Germain and Chambord and then garnished with a few fresh berries. 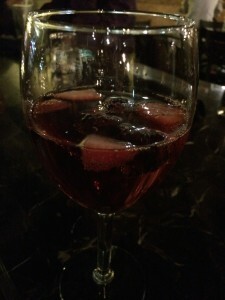 I love sparkling drinks but ones that aren’t too sweet and although this was good, it was still a bit too sweet for me. 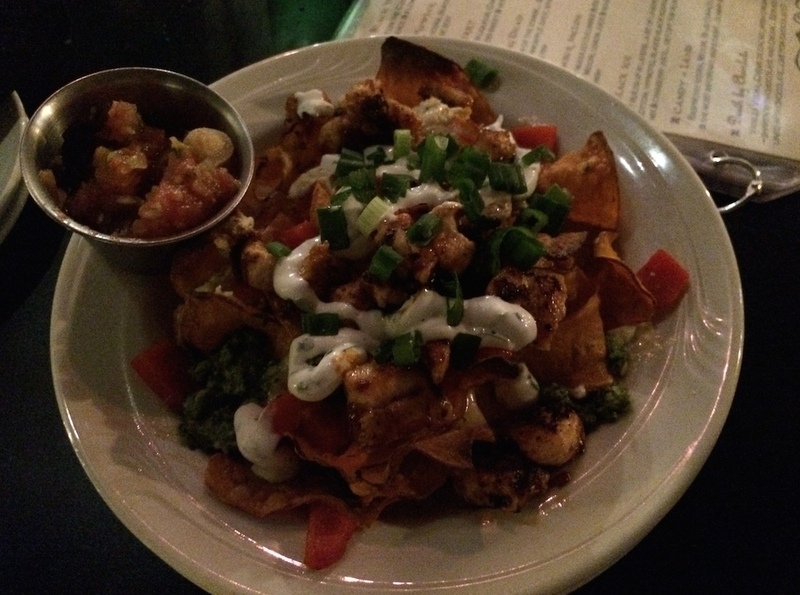 At the suggestion of the bartender/waitress, who was very kind and helpful, I ordered the sweet potato nachos. I was very skeptical, but she assured me that they were good and to order the ancho chicken on top. I just went for it and she was right – they were SO good. The sweet potato chips were nice and crispy, and they were topped with Irish cheddar, a really phenomenal house made pesto, Boursin, roasted red peppers, scallions and a side of pico de gallo. I didn’t even end up using the pico. 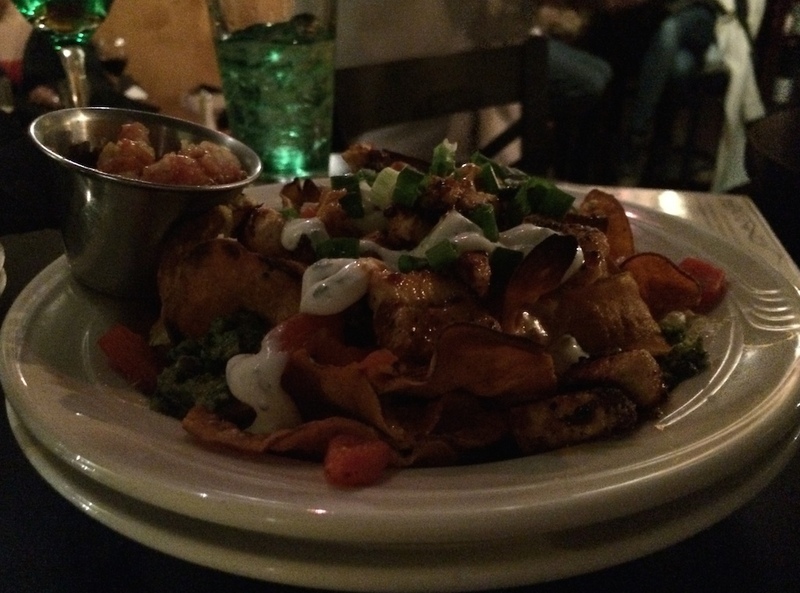 The chicken on top of the nachos was cooked well and had a nice seasoning that really tasted great mixed with the Boursin and pesto. The plate looked small when it was brought out, but as a snack for two it was the perfect size. If we both were expecting to share it as a meal it wouldn’t have worked. The rest of the menu was a mix of sandwiches and some unique-sounding entrees. The only thing that really stood out was the Quadruple Threat Club, which says it has Rashers, prosciutto, jalapeno bacon, pork, melted gruyere, lettuce and tomato on rye bread. The place was closed for the event, so I’m not sure how busy it gets on a typical Thursday night, but when it opened again at 9 p.m. about 3 or 4 people who looked to be regulars filed in and took a seat at the front bar. If you’re looking for a new watering hole on the westside, I’d say Alchemy could be a top contender.